The national average is still low, but some states are growing increasingly vulnerable to preventable diseases. Doctors across the country are hearing more and more complaints about diseases we typically associate with history books or sudden, pixelated deaths on The Oregon Trail. Measles, a disease that was essentially eradicated in the United States in 2000, is spreading, with 288 cases representing 15 separate outbreaks reported nationwide just in the first five months of this year. That's a 20-year high. Meanwhile, pertussis, or whooping cough, cases are up 24 percent over last year. And the Centers for Disease Control and Prevention is pinning the blame on parents who won't vaccinate their children. The United States eliminated measles in 2000 (meaning that the country stopped experiencing home-grown measles outbreaks) thanks in large part to the popularity of the measles, mumps and rubella vaccine, known as MMR. Pertussis has been much more difficult to eradicate, although the vaccine is also a requirement for entry to most schools. But as the number of people in the United States who request exemptions to avoid vaccinating their children for either religious or philosophical reasons continues to grow, the number of people who are at risk of contracting measles and pertussis is increasing along with it. And that trend is expected to continue through the year. As Americans travel abroad, particularly those who are unvaccinated, the chances of their bringing measles or pertussis back with them are extremely high. "We haven't yet begun the spring and summer travel seasons, which is when we usually have a lot of [measles] cases here in the U.S," Dr. Anne Schuchat, the director of CDC's National Center for Immunization and Respiratory Diseases, warned in a conference call with reporters last week. Measles is wildly contagious, with the almost certainty that any unvaccinated person who is exposed to the disease will contract it. Just look to Virginia, where one infected child's public schedule over an eight-day period has put the entire Virginia-Maryland-D.C. area on alert. "If you or your family haven't been vaccinated and you encounter the measles virus, they will get sick," Schuchat said. Nearly half of the measles cases so far this year have occurred in Ohio, where 138 individuals have reported contracting the disease. Although the state has a relatively high number of vaccinated people, the outbreak has been sweeping through the state for months because of a few isolated but large pockets of unvaccinated individuals. The outbreak began last October when a group of Amish men traveled to the Philippines (which is experiencing a massive outbreak affecting at least 32,000 people) on a mission trip and brought the disease back with them. Because most Amish communities don't believe in vaccination, measles is spreading from one to the next. But it's not just the Amish who are suffering. One of the major benefits of vaccination is what's called "herd immunity." When the vast majority of the people in a given community are vaccinated, the chances of those who cannot be vaccinated of getting a particular disease goes down drastically. When a greater proportion of a community isn't vaccinated, say in an Amish community or a neighborhood of parents who buy into the anti-scientific claims of a link between vaccinations and childhood autism, the chances of the disease spreading to those who cannot be vaccinated grow. A small, but significant portion of the U.S. population cannot be vaccinated either because they are too young, they're allergic to the vaccine or a component of it (latex, eggs, etc. ), they are pregnant, or because they have cancer, HIV, or another immunodeficiency. Measles is dangerous, particularly for those with preexisting medical conditions. Fifteen percent of people who have contracted measles this year have wound up in the hospital, according to the CDC. For those who have, pneumonia has been the most common complication. So far, there are no reported deaths. Measles is also one of the more deadly diseases for children, particularly for kids who are too young to be vaccinated. Typically, doctors suggest that children get their first measles vaccine at 12-15 months and the second dosage before entering school, around 4-6 years of age. Among the unvaccinated, roughly 6 percent of cases reported this year occurred in children too young to be vaccinated, while another 17 percent afflicted children under the age of 4, who are too young to have received both doses, according to the CDC. Ninety percent of measles cases so far this year have affected those who are unvaccinated or individuals who were unsure of their vaccination status, according to Schuchat. Incidences of whooping cough are also growing. Already this year, 8,521 cases have been reported, with most of them in California, Ohio, and Texas. That represents nearly a 50 percent increase from April, when the CDC announced that pertussis cases had risen 24 percent over the same period in 2013. Like measles, pertussis can lead to pneumonia and can be deadly in babies. Because the disease is highly contagious, those who are not vaccinated can easily pass it on to infants and to other unvaccinated individuals. Overall, Schuchat said the country is doing relatively well in vaccinating children. Ninety-nine percent of American children have received at least one vaccination, though the number of children who are fully vaccinated is much smaller. Only 68.4 percent of children between 19-35 months had received a full combination of vaccinations in 2012. The numbers also vary by disease. Between 2008 and 2012, the number of children between 19-35 months old who received all four dosages of the pertussis vaccine declined 2 percentage points, to 82.5 percent. The numbers for the MMR vaccine were better, falling only 1 percentage point during the period to 90.8 percent. Although the national average of individuals who have requested nonmedical exemptions for vaccinating their children in the United States has remained low, there are communities in which anti-vaccination sentiment is growing. And that puts those who medically cannot be vaccinated, or are too young, at greater risk. In Oregon, in particular, nearly 7 percent of kindergartners last year were not vaccinated for philosophical and religious reasons. 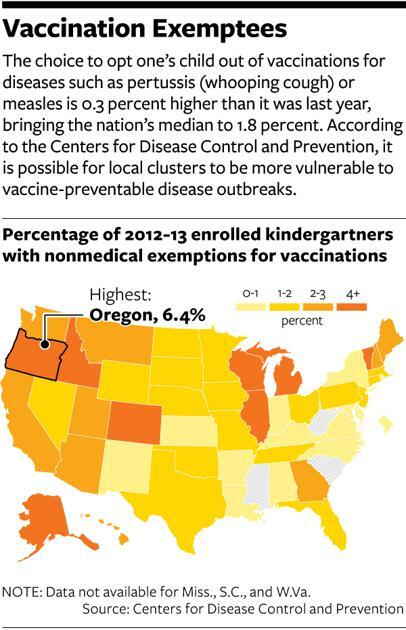 In Idaho, Michigan, and Vermont, more than 5 percent of kindergartners avoided vaccination for nonmedical reasons. Outbreaks in those communities could spread easily and endanger children across those states. Some religious communities, including the Amish, oppose vaccinating on ideological grounds. But there are also low-information smear campaigns being run across the country encouraging parents not to vaccinate their children. Notably, actress Jenny McCarthy became a major opponent of vaccines, linking them, falsely, to her son's autism in numerous media appearances and in an accompanying book. Her then-boyfriend, actor Jim Carrey, made similar arguments, bringing more celebrity to the cause. "We know there are communities where large numbers of individuals have decided not to be vaccinated," Schuchat said, but added that although a number of parents have objected to vaccination on philosophical, not religious grounds, the supposed link between autism and vaccination hasn't resulted in statistically significant uptick in unvaccinated children. For now, the CDC is pushing even harder for children and adults to get vaccinated, and urging those who aren't sure about their status to get an additional vaccine. That way, Schuchat hopes, they can contain the problem. "This year we are breaking records for measles," she said, "and it's a wake-up call, because we don't have to let this get even worse."